Click the button below to add the Copper Range Hood '0212' to your wish list. Kitchens equipped with copper range hoods look really good. Various patinas finishing can be used to personalize them. Hood model 980212 is made available either as central island or wall mount. The color choices are antique, coffee, honey and natural fired. It has a colonial type styling and is decorated with decorative apron. It can be connected to the house ventilation system through the back wall or ceiling. Range hood interior can be prepared for any brand insert. To have it customized select $200 custom work option. As an alternative buy this hood with equipped with a simple 200CFM ventilator. Delivery estimated for a month including copper range hoods production. The range hood 0212 is relatively easy to care. Avoiding using strong cleaners, don't use steel wool, brillo pads nor wire brushes. Instead, wash it with hot soapy water and scrub gently with a soft nylon brush. Dry the hood surface with a soft cloth. Avoid prolong surface exposure to acidic foods such as tomato sauce, catsup and citrus fruits. If the metal remains in direct contact with those and other similar substances, it may discolor. Rustica House range hoods are meant for domestic kitchen use only. For any information about patina repairs search the web. There is plenty information and repair kits available. 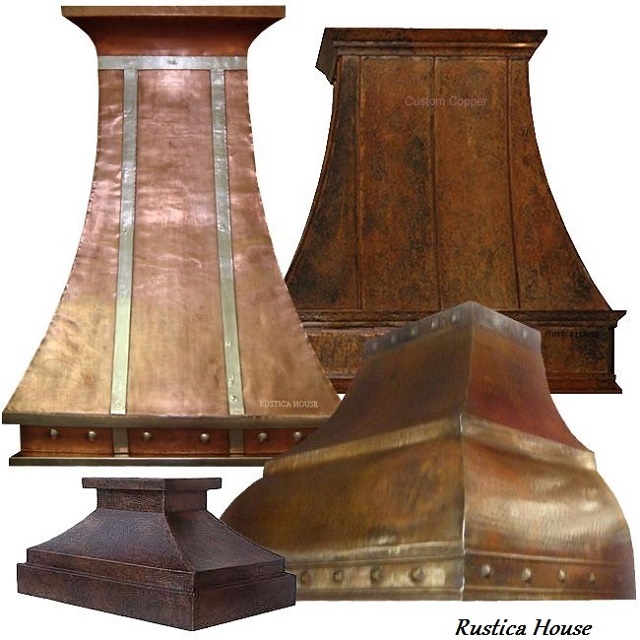 myRustica recommends using a experienced contractor for copper range hood installation.